Every January 25th is National Infusion Nurse's Day. Do you know what an infusion nurse does or the many ways they can help your loved one at home? Infusion Nurses are Registered Nurses who specialize in giving medicine and fluids to patients through injection or infusion. They require additional training and knowledge of the techniques to perform and monitor an infusion, including the equipment as well as the often highly specialized medications they are infusing. They monitor patients for their reaction to the medication being administered, manage their tubing and pumps, maintain arterial catheters, and stay aware of potential drug complications. Infusion Nurses can be found working in a multitude of locations, including places like hospitals, long-term care centers, clinics, and home health agencies. The aging of America, the advance of new medical technologies, and the focus in healthcare on reducing costs are fueling demand for infusion nurses. Demand for infusion nurse services is expected to rise 26 percent by 2020, according to the U.S. Bureau of Labor Statistics. Until recently, infusion nursing didn’t play a prominent role among the most sought-after nursing specialties. However, infusion nursing is expected to receive more focus as more Americans are living longer and living with chronic illnesses for which new treatment therapies are being designed and include newer medications that must be injected or infused by a specially trained professional. Examples of conditions for which a medication may be injected or infused include certain autoimmune disorders like rheumatoid arthritis, Chron’s disease, multiple sclerosis and other conditions like heart disease, liver disease, and gastrointestinal disorders. BrightStar Care celebrates Infusion Nurses among our rank of specially trained Registered Nurses at our Joint Commission accredited home-care agencies. Every BrightStar Care RN Director of Nursing has membership in the Infusion Nurses Society – the gold standard setter in the infusion nursing world. The Infusion Nurses Society (INS) is an international nonprofit organization founded in 1973. 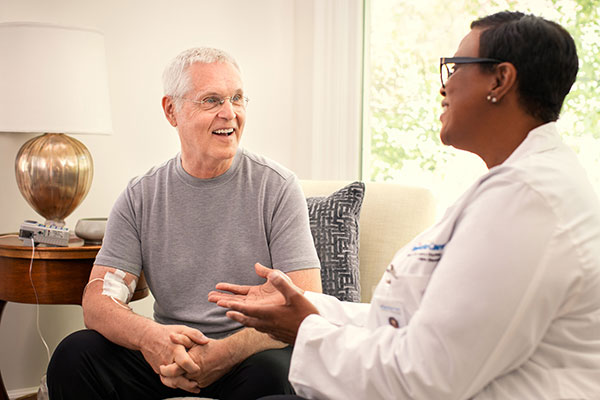 For more than 40 years, INS has been committed to bringing innovative new resources and opportunities to a wide range of healthcare professionals who are involved with the specialty practice of infusion therapy. The organization is dedicated to advancing the delivery of quality therapy to patients, enhancing the specialty through stringent standards of practice and professional ethics, and promoting research and education in the infusion nursing practice. “We are proud of our infusion nurses who provide premium person centered high tech care in the client’s own home following the highest care and safety standards of The Joint Commission and the Infusion Nurses Society," stated Sharon Roth Maguire MS, RN, GNP-BC, Chief Clinical Quality Officer at BrightStar Care stated. Clients they serve routinely comment on their BrightStar Care Infusion Nurse with remarks like "She is part of our family," and "I don’t know what I would do without him; no one else could do an infusion like he does and make me laugh about something that could be so sad and stressful. He changed my life!" We would like to take a moment to thank all of the BrightStar Care Infusion Nurses that all go above and beyond for our client's every day. You are the reason they are able to have their treatment in the comfort of their own homes. Thank you for all you do!